She awakened with a gasp, cold, wet and naked. Scrambling to stand in the shower stall, she tripped over the woman’s corpse strangled at her feet. Sprayed by water long since drained of warmth, a melancholy face —empty of life— was the only witness to her christening. A scream and the sound of shattering glass awakened the neighbors. The police were summoned. A murderer was arrested. But sobbing pleas were unheard as they removed the victim’s body. When the lights went out, she remained crouched and weeping on broken shards in the bathroom. She awakened with a gasp, cold, wet and naked. A grimy shower, faded paint, cigarettes and ashtrays. The old woman was insufferable; always yelling, always angry, always smoking. A wet grip pushed her in the shower stall, then taught her to fear the bathroom. The clammy touch soon invaded all corners and rooms, and often no cigarette would remain lit. Their battle became a war. A prayer circle came, laying bibles like landmines. She burst a pipe and drenched them. A priest came after, waving crucifix and prayer like weapons to condemn and smite her. She retreated to her stall. Deaf to all but his own voice, the priest’s rosary was grabbed and he was thrown screaming through opaque glass. He left bloodied, the old woman left with him, and days later the movers heard a woman crying. They found no one. She awakened with a gasp, cold, wet and naked. A new door opened to clean tiles and yellow walls as the next invader took residence. Still living out of boxes, he heard wet footfalls and the bathroom cabinet open. Putting down his tablet, he then pondered the sight of his medicine bottles floating in the toilet. Moist fingerprints were found on slammed doors and turned faucets. His artwork was smeared. His bed was soaked as he slept. But the young artist and his persistent cough remained to haunt her. Enraged and sopping, she came one night into his studio. Brushes were snapped, paints were thrown, until her drenched fists rose to smash his latest canvas. Paralyzed, she saw herself in airbrush and acrylic. A melancholy face emptied of life, and above the shower drain. She awakened with a gasp, cold, wet and naked. The shower sprayed her, and then he entered coughing. Sick and shivering, he let the water scour him. She watched the blood he coughed and spat spiral down the drain. He was alone, and fragile. He was warm. His eyes acknowledged her dripping touch. Then neither were alone. He donned a towel. He brushed his teeth. He looked back as if he could see her watching from the stall, then gulped down his many pills as was his nightly ritual. She awakened with a gasp, cold, wet and naked. The apartment was still. He’d not come to the shower. He’d not come for his pills. A shallow cough drew her wet steps down the hallway, and she came to his bedside hearing labored breaths. A moist touch didn’t wake him. Nor a shake. Nor the tears that fell on his face. His breath faded and rasped away, surrounded by his sketches. Surrounded, over and over again, by the wet haired, sad-eyed muse he saw only with his mind’s eye. She was his muse and his assurance. The watery promise that there was more than the pained life he departed before sunrise. And then he was gone. No voice. No light. Nothing. Nothing but her tears and her loneliness. She awakened with a gasp, cold, wet and naked. Her silent scream roused no neighbors. 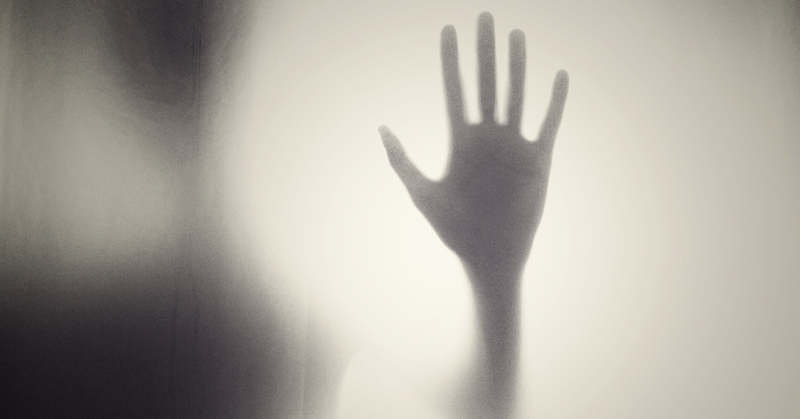 Her clawing fingers on frosted glass left streaked messages for help the living would not see. She collapsed where she had awakened —where she always awakened— and curled beside the drain, she wept. The stall opened while she laid despondent, and feeling a dapple of sun on a chill shoulder she looked up. He offered her his hand with a cough, and with quivering lips beaded with tears she hesitated to grasp it. But then in the warmth of his eyes, in the glory of being truly seen again by another, she gripped his fingers. His strength joined with hers, and together they struggled against the damp prison. Throughout the building, drains groaned, bathtubs burbled, and plumbing shook with a mildewed panic. The shower’s chains of plastic and glass, its manacles of pipe and porcelain, fought to keep her captive. But as every tenant would later recount, there was a sound like a mighty gate falling off its hinges before the fire sprinklers spewed forth upon everything in the complex. She awakened with a gasp, warm and free in their bare embrace. His eyes promised there was more beyond the entrapment she’d known, and he led her to the door. With her hand in his, water spilled like rain. A pouring baptism that cleansed the apartment, of their presence. Thank you, Cathleen. :-) I enjoyed working with a different style on this one. Thank you Debbie! :-) Glad you liked it!